With early January's Polar Vortex already fading into distant memory, it is sobering to realize that communities are still struggling to recover from the October 2012 devastation left by Hurricane Sandy. The Category 3 storm destroyed thousands of homes and killed 286 people, 72 in the US alone. “While speedy repair work and first rounds of federal dollars are contributing to the massive rebuilding effort,” wrote engineer and area resident Michael Sweeney in a December 1, 2013, letter to the Hudson (N.J.) Reporter, “a second looming wave of damage is beginning to unfold.” Sweeney went on to describe the “latent damage” created by saltwater penetration into communities’ physical infrastructure. 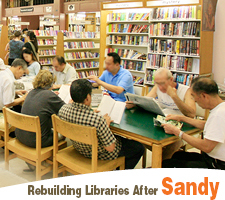 Libraries—not all of them intact post-Sandy themselves—nonetheless offered relief to their communities. Emergency services ranged from daytime shelter, to reading and programming respite from the trauma experienced and a headquarters for filing insurance claims. But how have the libraries themselves fared? First the bad news: At least one library was too devastated to resume service. The boards of directors and trustees of the Penns Grove–Carneys Point (N.J.) Public Library voted in November 2012 to permanently shutter the library, but not just because of soaked carpet, shelves, and walls. The damage was not insurmountable, but it was the second time in recent years that the library had been flooded. In fact, it had just reopened in June 2012 after undergoing almost a year’s worth of repairs and waterproofing because of damage from Hurricane Irene in August 2011. “Every measure we took last year to prevent future damage worked,” library board of directors President Linda Huff said in the November 10, 2012, South Jersey Times. Still, she said, “This could keep happening every year. We just can’t afford it anymore.” The library’s declining revenue also factored into the decision. Among the libraries that regrouped was the Jersey City (N.J.) Free Public Library’s main facility, which had a relatively quick repair turnaround, reopening December 17, 2012, after suffering $1.4 million in flooding damage. New York University’s Ehrman Medical Library took on 14 feet of water, destroying most of its print collection. 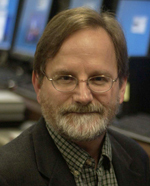 The library was also forced offline when several of its servers were flooded. What emerged in May was a mostly digital library operated from office space near the Langone Medical Center the library serves. The last of Brooklyn Public Library’s six facilities to restart operations after Hurricane Sandy was the Coney Island branch, which reopened October 23, 2013. It featured commemorations of the area’s history and storm damage such as the insertion in the ceiling of restored planks from the historic Coney Island boardwalk, which was destroyed by Sandy. The October 23, 2013, New York Daily News reported that repairs to the branch cost $2.7 million. “It’s a community that’s been through a whole lot,” says Brooklyn Public Library President Linda Johnson. Queens (N.Y.) Library suffered similar devastation. “Four buildings were closed due to storm damage,” Manager of Communications Joanne King says. “Two had interim service in modular structures almost immediately. The library in Broad Channel was fully repaired and reopened in January 2013. Queens Library at Seaside reopened at the end of October 2013.” As for the Arverne and Peninsula branches, their renovations are scheduled for completion this year. King says that “how the community reacted to library storm damage was informative in itself,” noting how “people came from far and wide” for the Broad Channel reopening, full of emotion. “Reopening the library was a metaphor for returning to normalcy, stability, and unity, in addition to all the valuable services the library provides. The adults who studied basic literacy and English as a second language at Queens Library at Peninsula were almost militant about returning to their studies,” she explains. “The physical community may have been in shambles, but they wanted their study group now.” Circulation also tells the story: It has risen 28% in the modular building that fills in for Arverne. Thanks to a Bank of America gift to supplement the branch budget, service there is seven days a week with the focus on workforce development.